I always thought my great grandmother wanted me to be a seamstress because it was a respectable career for the women of her era, and especially for African- American women who had very few options. I always thought she could picture me perfecting my skills in tailoring, or dressmaking or even millinery…she did love to wear hats like all the fashionable women of her day. A few weeks ago I realized I was wrong. During a conversation with my father, he reminded me that Grandma Lydia had worked as a seamstress herself. The job allowed her the ability to raise her three sons on her own, to be self-sufficient and independent. Then someone mentioned that Rosa Parks was also a seamstress. 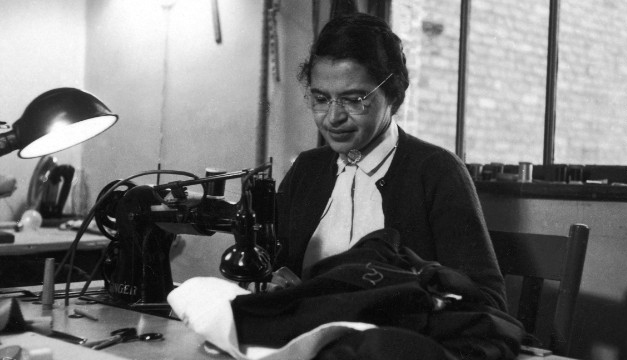 Rosa Parks worked at a Montgomery department store as an in-house seamstress. Her hours were long and the work could be humbling for the educated and highly-literate Parks, who was taught to read and write at an early age by her mother. She excelled in school but was forced to leave high school to tend to her ailing grandmother and never returned. Instead, she accepted a job as a seamstress in a shirt factory, and sewing became her daily life. One day after a long day at work as a seamstress in a department store, Ms. Parks refused to surrender her seat to a white passenger on a segregated Montgomery, Alabama bus. That act spurred on the 381-day Montgomery Bus Boycott that helped launch nationwide efforts to end segregation of public facilities. The city of Montgomery had no choice but to lift the law requiring segregation on public buses. While she did not take her seat with the plan of refusing to give it up, when she made the decision not to move, she did so with foresight, thoughtfulness, and intent. She did so after hours of labor at her sewing machine, and with full knowledge that she might lose her job as seamstress at that department store–which, in fact, she did following her arrest.” Her actions weren’t accidental. They were a response to years of being the witness to injustice, and they changed the entire system of separate and unequal segregation in the south. Twelve years after she refused to give up her seat I was born. Of course, my great grandmother wanted me to be a seamstress too. Which, I suspect, is why my mother taught me to sew. What a wonderful legacy to aspire to fulfill.